by Bill Dwight on Wednesday, February 29, 2012 at 4:19 PM | LEAVE A COMMENT! What does it take to be selected as one of the coolest startups in America? Those certainly sound like admirable qualities. 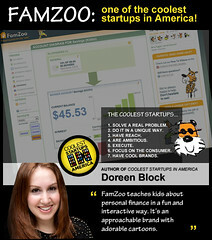 So, naturally, we were thrilled and honored to find out that FamZoo is among the 72 coolest startups in America profiled in Doreen’s new book. Want to see all 72 featured startups? Just scroll down to the list below. FamZoo teaches kids about personal finance in a fun and interactive way. It’s an approachable brand with adorable cartoons. She continues with kudos for our customize-ability to match the needs and values of any family, our smart distribution strategy, our Best in Show award from Finovate (good quote about our startup space, Jim), and our gift option for “forward-thinking grandparents”. What does Doreen ding FamZoo for in the “Choppy Waters” section? Ha, not telling! To read our full profile and the profiles of the other 71 cool startups, grab Doreen’s book on Amazon. Want to read a quick interview with Doreen first? Check it out here on the New York Times Small Business blog. Who else is chillin’ on the Coolest list? I’ve embedded the List.ly list below. The short descriptions and tag labels match Doreen’s from the book. Vote on your favorites by clicking on the thumbs up icon. Click here if you can’t see it, or if you’d like to filter it by the category tags, or if you’d like to sort it by options like “crowd rank”. Chores? What chores? No more excuses!